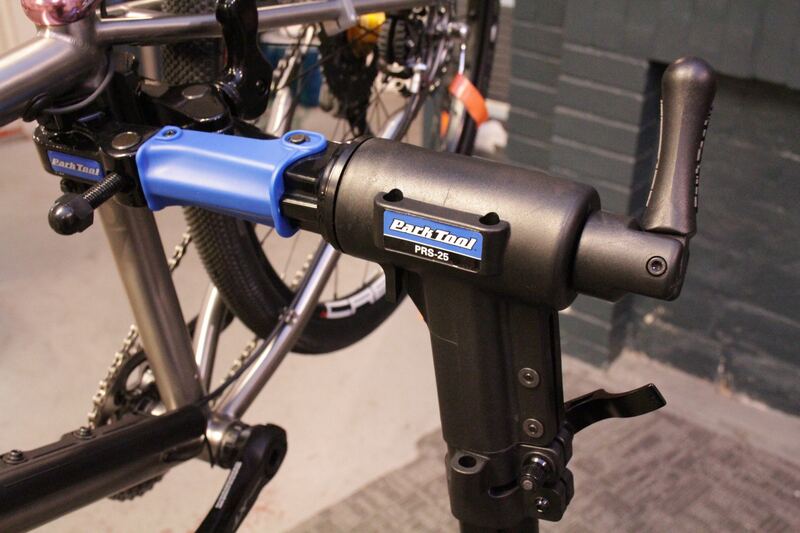 Park Tool has been the first name in bicycle tools for decades, at least here in the States. For me worn and weathered Park workstands standing beneath faded pro rider posters are the trappings of every good bike shop. I’ve never worked in a bike shop that did not rely on heavy Park workstands drilled into the shop floor or affixed atop a seventy pound steel plate, and I wouldn’t have it any other way. 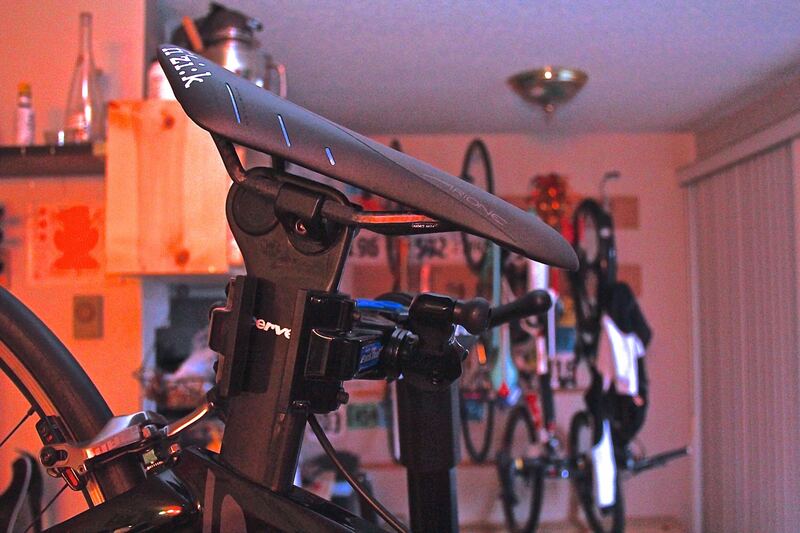 But when it comes to workstands for wrenching at home or in the field, I haven’t exactly been faithful to the brand. Over the years I have had a few different brands and configurations, and the bikes have changed quite a bit since then. So coming to this Park PRS-25 Team Issue repair stand sorta feels like closing a circle. 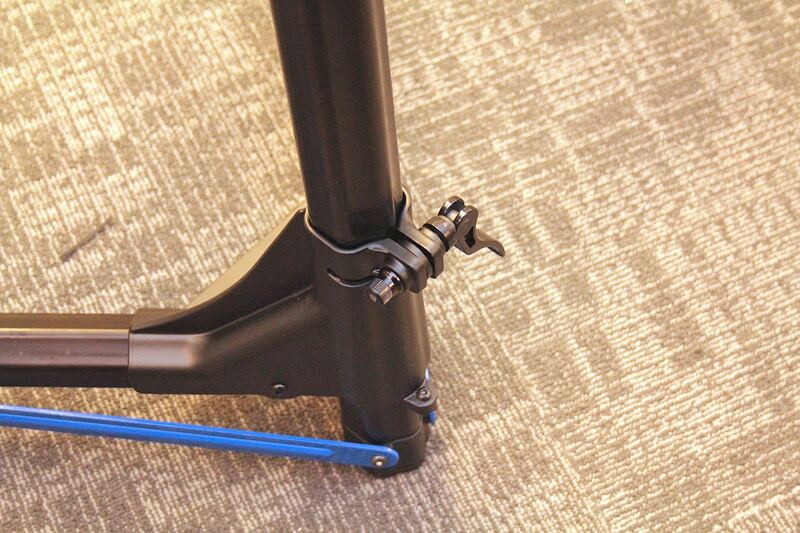 The $325 PRS-25 is Park’s top portable repair stand in the seatpost clamp configuration. At just 13-lbs the PRS-25 folds down to 47″ but can put the clamp arm a full five feet off the ground, so you can work on bikes without hunching over. The two-legged base quickly folds out to form a triangle 36″x36″x45″, giving plenty of stability even when you will swing a bike up vertical to fish cables around the bottom bracket, and the rotation is firmly held in place with a pivoting lever. But the best part of the #100-25D Micro-Adjust clamp to quickly and securely grip a wide variety of tube shapes, including aero seatposts and other non-round tubes from 23-76mm. The cammed clamp lever flips to open or close quickly, but you do the final tightening by cranking the knob. The Park PRS-25’s Micro-Adjust clamp makes working on bikes with proprietary seatposts and seatmasts much more practical. 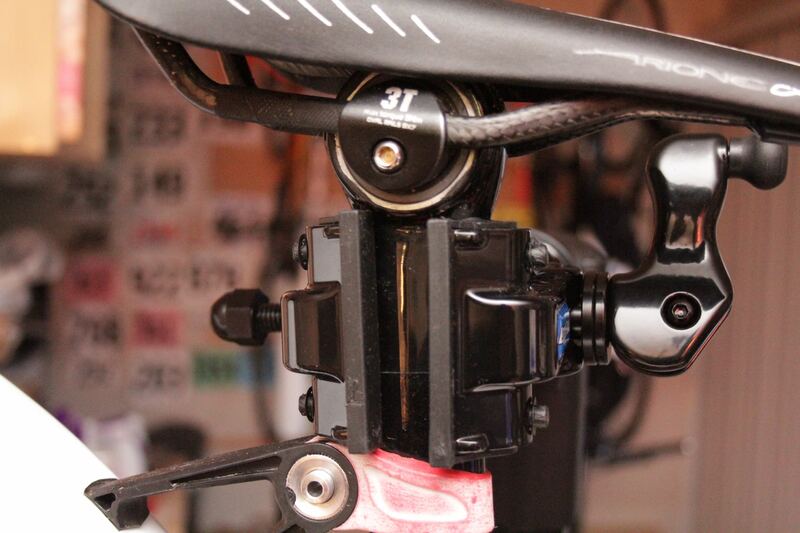 The Micro-Adjust clamp is tightened with a rotating arm that has a cam, so you can stick the bike in, flip the cam over to close it down fast, and then precisely crank it down the rest of the way. This makes the clamp fast to use but minimizes the chances that you’d accidentally clamp too hard on the tube (crucial with carbon fibre). The clamp’s contact surfaces are notched in the middle to steady aero seatposts and frame tubes without crushing them. This clamp is so much more versatile that I want to replace the clamps of the 35-year-old Park shop-grade stands at work. Among other portable repair stands, I find the V-shaped base of the PRS-25 to be more stable than tripod-style bases, since PRS-25 cantilevers the weight of the bike over the widest side of the triangle footprint. The stand’s base extensions are very close to the ground when deployed, and I learned that I could pin one of them down with my foot if I wanted some momentarily added stability. I mentioned that I have used a variety of portable repair stand configurations before. For a while I thought that repair stands that clamp the fork tips and brace the bottom bracket were the cool way to go, if for no other reason than that all the European pro team mechanics preferred them. But now I am thoroughly in the seatpost clamp camp. For one thing the BB/fork mount stands are really only practical if you only work on bikes that are more or less identical, like a pro team would have. If you work on a variety of bikes with different BB contours, front-center lengths, and front axles, setting up the fork clamp becomes tedious. Since you have to drop the front wheel out, you can’t make useful adjustments to the front brake, especially for disc brake bikes. Those Euro team stands do not accommodate front fenders most of the time either. With the advent of thru-axles, flat-mount brakes, and internal cable routing, there are a lot of reasons that a mechanic might want to put a bike vertical or get underneath the frame for better access, but the BB/fork stands are basically always horizontal and typically much lower than the PRS-25. About the only thing that a BB/fork stand does better the PRS-25 is provide a firm support when really torquing with a threaded bottom bracket, which is hardly a viable selling point to road team mechanics anymore (because good luck finding a road bike with a threaded BB). 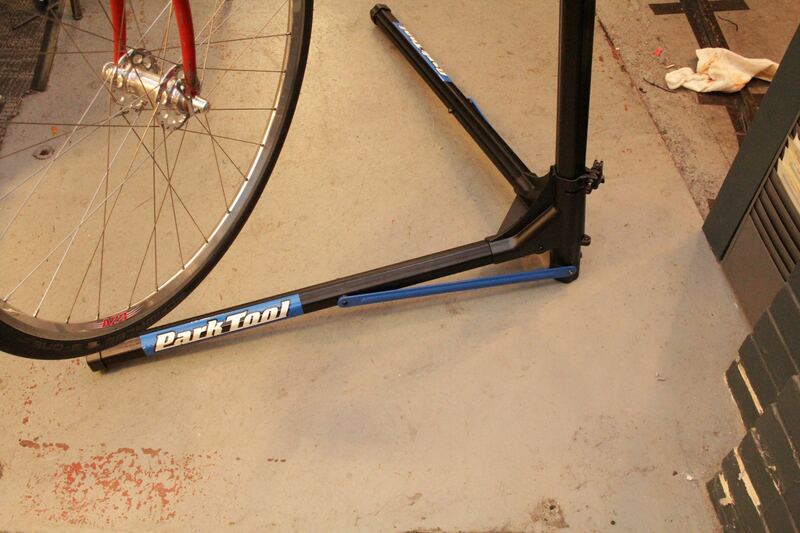 Park Tool actually makes a top quality BB/fork stand called the PRS-22.2 ($340), but I just think that it is too limited outside of a pro road team environment. After twenty years of wrenching on bikes, I consider the Park PRS-25 to be by far the most ergonomic portable stand I have ever used. 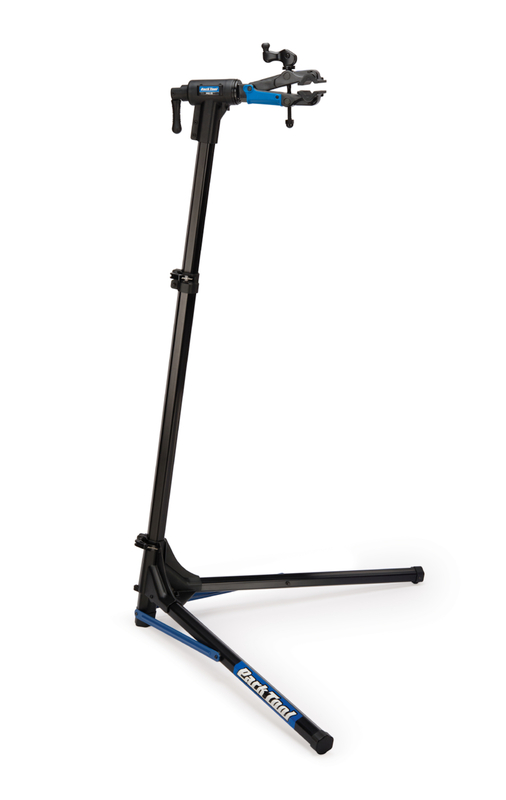 There are cheaper or perhaps lighter stands that fold up marginally smaller, but they concede a lot to achieve that. At this point in my life I don’t have time for those compromises.